When your child is in a cast, getting a car seat that is safe, is of paramount importance. It is highly likely that your current seat won’t work as it simply won’t be wide enough or deep enough to safely hold your child. In the UK there are two car seat options available to you. The 2-Way Elite CDH Modified (Britax) has been specifically adapted for children in a cast and is available from the In-Car Safety Centre. 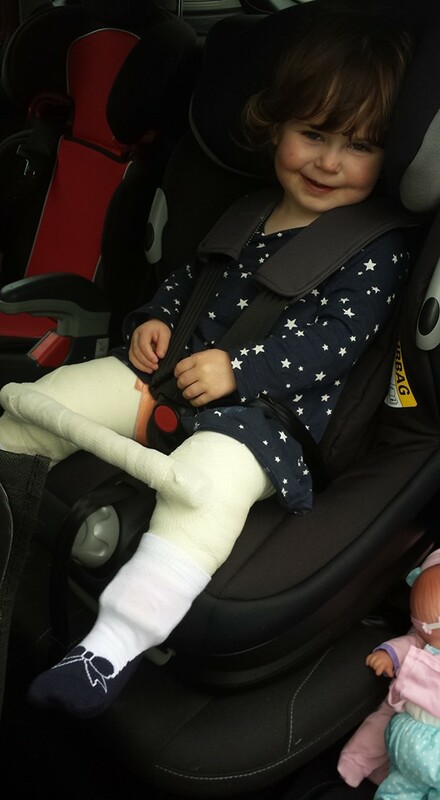 This fantastic company has nearly 30 years experience of providing suitable car seating to meet the ‘special needs’ of all children and they are ‘the experts’ when it comes to DDH and casts. This seat is only to be used rearward facing as this significantly reduces the load weight on both the child and the harness in the event of an accident. The seat is supplied ready for use, fully adapted, and a manual is sent with the seat and ‘how to fit’ videos may be viewed on the website. Installation with two or three-point seatbelt. Five point safety harness with three setting height adjustable harness. ONLY to be used rear facing when the child is in the cast/brace and rear facing tether straps are supplied. For children under 18 months, the additional head support is recommended. The 2-Way Elite will accommodate most children in a spica and there is an extended crotch strap and additional padding to lift the bottom and support the back. The seat be used rearward facing or forward facing from 9 – 25kg AFTER the child is out of the cast. You can either loan this seat from In-Car Safety or you can buy it outright. For children who do not fit into this seat, there is also the option of using the E-Z On Harness. For more details about both of these options and the loan offer, speak to one of the team at In-Car Safety on 02890 742052 or go to www.incarsafetycentre.co.uk. The second option comes from Maxi-Cosi who have worked with medical specialists and adapted the Maxi-Cosi Opal, to create the Maxi-Cosi Opal HD. The Maxi-Cosi Opal offers additional back support as well as the leg space needed for children who are in a cast. The seat has comfortable, padded seats, an extra support pillow for younger children and safe recline adjustments. This easy to use seat has a compact design, which fits all cars as well as having a side protection system for optimal protection in side impact collisions. If you have any questions please get in touch with the DDH UK Team and we can help further.